Since yesterday, I do not have any information about the oil level (no status, no level information). Is it something wrong with the sensor or Audi needs some time to measure it? No, I did not change the oil. But, if that's the case, don't you also get a low oil level yellow warning icon that shows up on the gauge face? I suspect that the OP's issue is a bad oil level sensor. I made 200km and the oil level came back! Were you parked on a hill by chance? Strange behaviour... Even when I added extra 0.5l the status did not change for ~1.5 day (cold or warm engine). 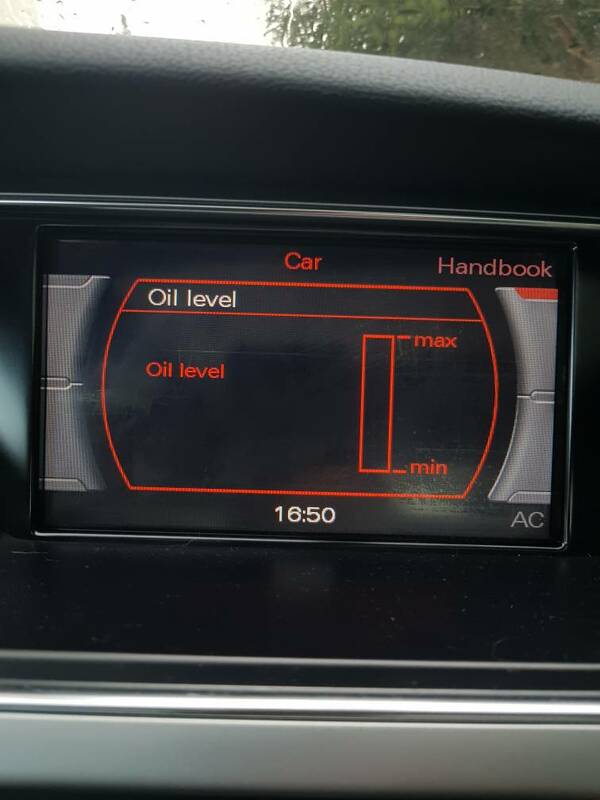 The first time trying to use the oil level sensor I let the car sit for 15 - 20 minutes and then it still took over 5 minutes for the display to register. Simple fix, I bought a dipstick. No more issues! I imagine it will give you the top me up message in the next few days. If you ignore the message it will go away and show as empty as in your photo. +1 for the above , that's exactly what I did cost me £8.00 from TPS and have the option of being able to check it when engine is stone cold.